(as well as terms and conditions of all sales), or contact us directly at (919) 732-3041. Tree prices are negotiable, depending on quantity ordered. Please contact us for discount information. Truffle tree orders must be signed by purchaser as acceptance of terms of sale. We offer the following trees, inoculated with either Black Perigord Truffle or Black Burgundy Truffle. Italian White Truffle is available at additional cost for experimental purposes. We are a North Carolina Department of Agriculture Certified Nursery. We can ship trees anywhere in the United States. 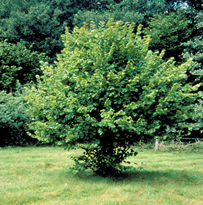 Filbert trees are grown from disease resistant or immune varieties. Contact us for special requirements. A small bush growing to 12 feet tall, it is the most common choice. Truffle production usually begins after 5 years. Its life span is up to 50 years. Our filbert trees are Eastern Filbert Blight Immune. Ranging from a small tree to 25 feet tall, this live oak retains its serrated green leaves throughout the year. Longevity is 75 years. High density plantings can start producing after 5 years. It is particularly adapted to somewhat warmer and dryer climates. Ranging from a small tree to about 70 feet tall, it is often used as an ornamental. 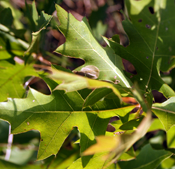 This deciduous tree has typical lobed oak leaves. It lives up to 100 years and is good for inter-planting with filberts. Production begins after 10 to 12 years. 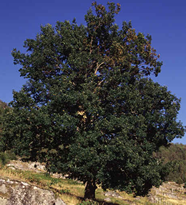 It is the longest lived of the truffle producing oaks, at over 100 years. It can attain tremendous size. 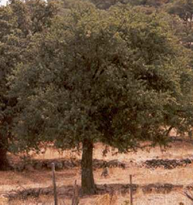 For truffle orchards, these are normally pruned to form multiple trunks to maintain orchard conditions. Production begins after 10 to 12 years, and it is recommended as an inter-planted tree. All are trees are inoculated with the specified fungus, but no guarantee is given for production, as growing conditions and grower care are highly variable and beyond our control.